For a long time, I never really understood coffee. I mean, I could see how you might pour an espresso over ice cream for a delicious dessert, but that was about it. I admit to being snobby towards people who ritualized their daily coffee intake. Why the regular pilgrimages to a favorite coffee shop, the refusal to acknowledge other lifeforms until draining a cup, the unnecessarily arcane paraphernalia used to brew a simple beverage? What was up with this ridiculous religion centered around bean-flavored water? Then...two years ago, my son was born. Oh, I thought I was so clever and organized when I cleared most of my schedule a bit before and after his projected delivery date. In a fit of insane optimism, I planned a heavy load beginning a week past his due date. And of course, that's exactly when he decided to enter the world. Strangely enough, I remember that week vividly. I say "strangely enough" because I probably slept a total of 12 hours that entire week. Salastina had rehearsals for a pair of Brahms concerts taking place 5 days later. I was loaned a Strad for the occasion (see pic below), while Maia was rockin' a Del Gesu. In addition to rehearsing and performing, we were writing the Sounds Genius script, marketing the concert, compiling ticketing lists, liaising with the venues, etc. Not only that, I was also playing on John Williams' Star Wars episode 7 sessions most of that week, leaving the house at 7:15am and getting back 12 hours later at the earliest, if we weren't in Salastina rehearsals afterwards. But that was the easy, familiar part. The new, exhilarating, heart-overflowing, and slightly terrifying part was this new being that entered my life. Nothing was going to stop me being there from the moment my wife first felt contractions, through labor, cutting the cord, reveling in skin to skin with our baby, cheering for him to latch, and during his first night on earth. At home, I jolted awake at night every time he peeped. Sometimes I'd suddenly and irrationally become afraid that he wasn't breathing, so I'd try to feel his breath with my hand or stare from different angles to see the rise and fall of his chest. I learned to swaddle and diaper while semi-conscious. As I'd shush and slow-dance my baby boy to sleep, my thoughts would careen off in unexpected directions about my place and role in the universe. We probably overreacted to many things, but he was our first child. In those first seven days (and still counting), there were so many surprises, an overwhelming amount of joy, and so little sleep. And to any mothers reading: you have my profound respect. That is a grind I had NO clue about before. During that week after my son's birth, desperation spurred my initiation into the mysteries of coffee. It went something like this: Crap, there's no way I can stay awake during the 2 hour drive to the studio...aaarrgghh ok lemme try the hot bean water. Yes, that really helps. Hmm, I just might join this religion." And that was my baptism. There is no missionary as persuasive as desperation, and I've been part of the faithful flock ever since. Directing Salastina, working, commuting, practicing, trying to evolve as a musician and violinist, friends, family, and raising a toddler...yeah, I can fit these things in my day if I plan well, sleep a little less, and drink some coffee. I recognize that it's a stimulant, so I don't drink it every day. When I do, I take one cup and suddenly become a more productive and efficient version of myself - another sign that this is a good religion. My wife loves it when I drink coffee. I fix things around the house, I'm proactive, and I check a bunch of items off the to-do list. I think she sometimes considers dripping coffee into my mouth while I'm sleeping. But it has become more than just a tool to stay awake, and now I actively enjoy a good cup. 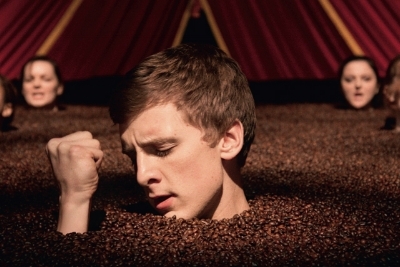 I'll sometimes randomly crave the scent of nicely roasted, freshly ground beans. And the taste of great coffee...who knew that bean water could be so rich, complex, and earthy?! Cold bean water (cold brew) can also be delicious, too. Maia laughs at me when I tell her about some new roast or that I now hand-grind my beans and Aeropress. But she also has recently begun to appreciate the virtues of this magic elixir. I'm guessing her initiation was a result of motherhood and desperation as well. Father, don’t be so hard! that I would be like a piece of shriveled up roast goat. "Stick in the mud" says he won't find Liesgen a husband unless she'll stop drinking coffee. Liesgen says sure, she'd like a "lusty lover", and a narrator tells us Liesgen has secretly put a stipulation in the marriage contract saying she'll be allowed to make coffee whenever she wants. This opera was probably premiered in Leipzig at a place called Zimmerman's Coffeehouse, where Bach regularly directed a society of amateur and professional musicians. For a while now, I've had this idea of performing Bach's Coffee Cantata in a similar setting to the premiere - and one so appropriate for the plot. We approached Mireya Jones, the owner of Jones Coffee Roasters in Pasadena, and fortunately she was tickled by the concept. They've generously agreed to host the event and have been wonderfully supportive in many ways. So we'll be performing J.S. Bach's Coffee Cantata at Jones on Sept 17 at 5:30pm! We'd love to see you at this pre-season fundraiser. Mireya and Larry Jones will chat about the history of coffee and tell us how coffee houses were different in Bach's time. By the way, they have fantastic coffee, which is included in the price of admission. We're going to have an outstanding roster of musicians joining us, all of whom are generously donating their significant talents for the occasion. *Yes, I realize it sounds like "a cup of yo"